* Author, The September 11 Victim Compensation Fund, Texas Bar Journal, January 7, 2002. Your eye for "angels" has paid off big time ! Great find ! 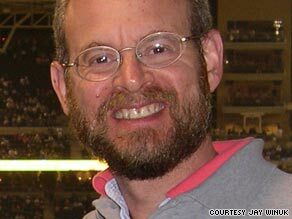 Here's another image of Glenn J Winuk courtesy of the alleged brother Jay Winuk who founded http://www.mygooddeed.org, which link now leads to 911dayofservice.org. The worldwide outpouring which they claim culminates in the official Youtube channel created August 2009 where I became the 15th member last night. Does the brown blemish in his right ear indicate where it was pinned back? The large gap between his front teeth is no longer there. So Jay first had at least one of his dumbo ears set flat against his head and by September 2009 he had his tooth gap filled. I suspect that Jay is the same person as Glenn. He began with flat ears, they were cosmetically altered dumbo-style, temporarily, to distinguish him from his "brother." I think that body morphing among the supporting actors plays a large part in this charade. I have noticed that many associated and dubious characters, YouTube shills included, seem to share an obsession with body sculpting and running marathons. For the first time, the annual "reading of the names" ceremony held each year at Ground Zero in New York City will include volunteers as well as 9/11 family members, in commemoration of 9/11 becoming a National Day of Service and Remembrance. Winuk, whose brother was post-humously awarded the 9/11 Heroes Medal of Valor by the U.S. Department of Justice over the weekend, is one of only three family members scheduled to speak during the ceremony. Only 3 vicsim family members participate. This is farcical considering that the extended families and friends of real people would far exceed the number of victims - if they were real. Great stuff Oz! I too suspect that it is the same individual! If you have a Youtube channel, please subscribe to "911dayofservice" ! brianv @ Jan 22 2010, 12:24 AM wrote: Great stuff Oz! I too suspect that it is the same individual! But we were all beat by Warren C who was pushing 911 Amateur in their comments 4 months ago! brianv 4 Jan 22 2010, 12:24 AM wrote: Great stuff Oz! I too suspect that it is the same individual! See the "thread" hanging from his sleeve? It extends across his arm and chest in a downward zig-zag pattern, pretends to be a pocket flap, cuts his tie in half and carries on. It's a couple of photos hacked together. Thread hanging from hat, near side, does the same. He's wearing two pairs of glasses. wsee? WC of course. Penny drops! I never realised! I think a 'duh' is in order! brianv @ Jan 22 2010, 12:59 AM wrote: wsee? WC of course. Penny drops! I never realised! I think a 'duh' is in order! I am now also a sarcastic member of this ridiculous youtube channel. Good company. Damn! That is the same guy. Brianv - the can of worms has just been tipped right out! I'd be interested to know how many of these actors are Jewish. I've never been a believer of "the Jews did it" faction, but if we accept that 9/11 was essentially victimless and was nothing more than a call to war and corporate theft, would they have had the people in the right positions to have pulled it off alone? his brother Glenn, who died at the World Trade Center." The Winuks, who are Jewish, took a cue from survivors of the Holocaust, who, when they had no body to bury, had put favored belongings of their dead in an otherwise empty coffin. In went Glenn's law books, a Jewish prayer book, a toy firetruck he'd had as a child. 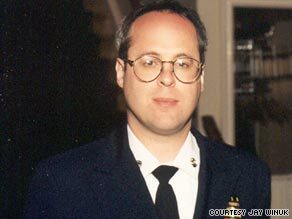 Then, the following March, Glenn's partial remains, along with those of several other firefighters, were discovered in what had been the lobby of the South Tower. Glenn's medical kit was at his side. The casket was dug up and his remains added. "It was a very hard [funeral] service," Winuk remembers. Mock funerals with empty coffins. "There’s the Continental Congress?A real WWII vet?Photos of workers at Ground Zero. 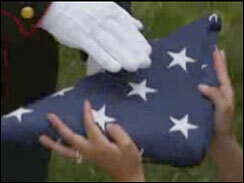 A close-up of a folded flag presented to a grieving widow at a military funeral? profiles of soldiers swelling with pride in slo-motion. But CBS News found that the footage of the ‘funeral’ and soldiers is what is called ‘stock’ footage. The soldiers were actors and the funeral scene was from a one-day film shoot, produced in June. No real soldiers were used during production." Don't you just LOVE IT when they play the mythbusters...of their own myths?